Espiritu Santo is widely considered to be the Jewel in the Crown of La Paz, Baja California Sur, Mexico, attracting visitors year-round to its outstanding natural beauty. 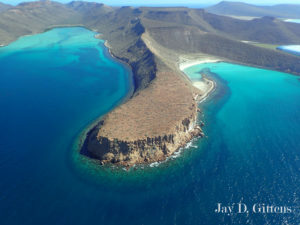 What most people refer to as an island is in fact an archipelago with Isla Espiritu Santo being the largest in the island group. Join Baja Wildlife Diaries on a journey to this amazing archipelago where the desert and the sea merge in striking contrast, emblematic of our beautiful region. 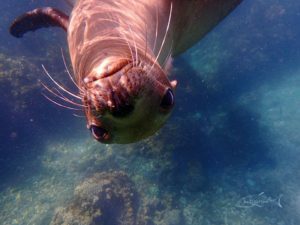 The highlight of the trip is of course to visit the sea lion colony at Los Islotes, a pair of tiny islets that support in the region of 400-500 individuals. Once there you will have around two hours to enjoy swimming with these playful creatures as well as enjoying viewing the surrounding coral reefs abundant with reef fish and invertebrate inhabitants. From here you will head to one of several awe-inspiring beaches for more snorkeling, exploring or to simply relax and enjoy lunch whilst taking in the breathtaking contrast of colours that surround you in this desert paradise. There is a choice of several places to explore during the trip dependant on the interests and preference of the group. Price per person is $125 usd including lunch, refreshments and National Park Fee. Includes snorkeling equipment, National Park bracelet, lunch and refreshments, certified captain and marine biologist guide. 09:00 – depart from Muelle Fiscal on the malecon. 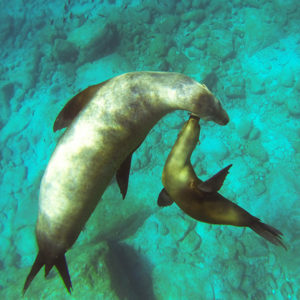 10:15 – 10:30 – arrive at the sea lion colony of Los Islotes for snorkeling with the friendly pups and juveniles. 12:30 – head to one of several possible beaches on Isla Partida or Isla Espiritu Santo for snorkeling, lunch and exploring the beautiful coastline. 14:30 – head back towards La Paz taking time to enjoy the rugged rock formations and high cliffs. 15:00 – arrive to the frigate bird sanctuary where up to 1000 pairs form a colony. 15:30 – 16:00 – return to Muelle Fiscal on the malecon. The Espiritu Santo Archipelago was formed during the Pleistocene era by tectonic and volcanic processes. Now these uninhabited islands support a wide diversity of life including in excess of 200 vascular plant species and over 70 species of insular fauna represented by amphibians, reptiles, birds and mammals. Among these, endemic species include the juancito, the babisuri, the black hare and the sand snake. In the marine component of the archipelago, it is possible to find at least 15 species of marine mammals including humpback whales, orcas and of course the California sea lion. The largest colony of sea lions is located at Los Islotes, two tiny islets at the northern-most point of the island group. This colony is reproductive and is the archipelago’s most popular tourist attraction. The Espiritu Santo Archipelago was declared a UNESCO World Heritage Site in the year 1995 and became a National Park in 2007. Price: $125 usd per person. Included: Snorkeling equipment, National Park bracelet, ceviche lunch and refreshments, licensed boat with certified captain, certified marine biologist guide. Not included: Wetsuit rental (for winter months – $10 usd per person), gratuities, land transportation. Trip highlights: Snorkeling, swim with sea lions, coral reefs, reef fish, beaches, rock formations, sea birds.